Seekins Precision brings a new rifle into its tactical rifle series, unleashing the Havak Bravo onto the masses. Built upon Kinetic Research Group’s Bravo Chassis, the Havak Bravo sports Seekins’ own Havak action and match grade 5R barrel. The bolt action rifle is chambered in .308, 6mm Creedmoor, 6.5 Creedmoor or 6.5 PRC. The Havak Bravo boasts a detachable magazine system, Timney 510 trigger, threaded 5/8-24 barrel measuring 24-inches. Sporting a 20 MOA Picatinny Rail, the Havak system supports accessory mounting. 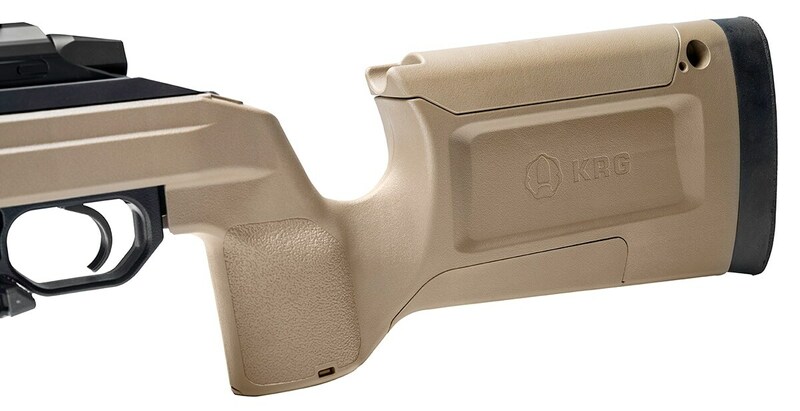 The action itself is finished in matte Armor-Black while the chassis comes in the choice of FDE, green or black. “The ergonomically superior KRG Bravo is one of the most comfortable chassis available. It features a stiff, full-length aluminum backbone to prevent flex and a bedding area so perfectly machined the action will fit like it was custom bedded. Meanwhile its extensive modularity potential and capacity for ergonomic adjustment make it ideal for virtually any shooter’s frame,” Seekins Precision said in a news release. The Seekins Precision Havak Bravo retails for $1,950. The post Havak Bravo rifle enters Seekins Precision lineup (PHOTOS) appeared first on Guns.com.